Here's a short devotional I wrote about the fact that we supply the lack and God supplies the sufficiency. When you've read/listened to it, maybe you'll want to hear the longer piece which I plan on posting tomorrow, called "Saved for a Rainy Day". We'll start the third chapter of 1Corinthians on Good Friday, 21st. There is only one boat in God's navy. 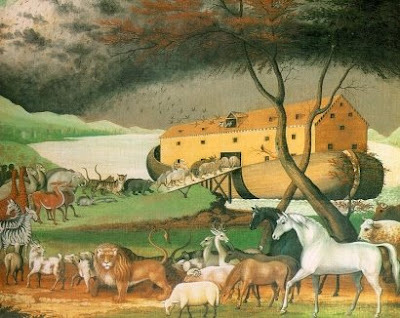 It is 450 feet long and made of Gopher Wood. I speak, of course, of the Ark. Getting into God's navy, and progressing through the ranks has been quite a bit odder than anything I have been used to. Prior to being in the "Senior Service" I had been a confirmed landlubber. Like the people of Noah's time I looked at God's navy of one single boat, and then at the notable lack of water and I laughed myself silly. But one day a bunch of sailors from the boat came ashore and talked to me, and my fascination with things naval had begun. Before I knew it I had somehow managed to get myself enlisted. Joining God's navy was great because apparently everybody who first signs on gets the rank of Admiral. I soon found that there was no shortage of Admirals on the Ark and felt right at home. I had the distinct impression that the whole navy was in desperate need of what I could do for them. I would soon have everything running like a top. Everybody on the boat, especially the junior officers, tolerated my high-handedness with a patience that was hard to explain. I laboured hard and long at controlling all aspects of naval operations, despite the conflicting orders of all the other Admirals aboard, but I became exhausted. Fortunately, the First Sea Lord, whom I had never met face to face, had taken note of my efforts and I was promoted to "Captain". In my new capacity things seemed much simpler. I no longer felt myself responsible for the strategic concerns of the entire Navy. All I had to worry about now was the tactical performance of the boat. There were still a lot of Admirals around, but I had learned that nobody was really listening to them anyway. New Captains sometimes made that mistake until they realized that such orders were always contradictory and counterproductive. I laboured hard and long as a Captain, believing that my plans, ideas and efforts were going to keep the boat afloat when times got tough. At last I became weary in this position, too - and again the First Lord promoted me. This time I was made a "Chief Petty Officer". Now, "Chief Petty Officer" was a title I could live with! I liked the "chief" part and I was pretty sure I could handle the "petty" bit, too. And boy was I right! I found that I could nit-pick at the minutest details of the condition of the boat and the work of other sailors. I did the job with great relish for a long period of time, truly believing that I would soon whip all those shipmates into shape and get them seafaring, as they ought to be. My ambition was that they should become just like me - perhaps as petty, if not as "chief". When the ratings below me resisted my best efforts to transform them, I came close to a nervous breakdown, but the First Lord came to my rescue again - just in time to avoid my being keelhauled. I was promoted to "Able Seaman." As an "Able Seaman" it was impossible to think of myself as anything but "able". Wasn't that what the title said? It had to be true. I was put to work below decks doing menial things, but I did them so ably that I was very proud of myself. I was thinking that, though I was not in charge of very much any more, at least the work I was doing would make a difference. Some of the officers who were still waiting for a promotion like mine assured me that my work was pivotal to the whole security of the boat. Without my small but crucial efforts, I believed, the whole kit and caboodle might suddenly plunge to the bottom of the ocean. With this in mind I obsessed and slaved over my small tasks until they became a strain, and eventually a drudgery. I became a shadow of my former self. My strength began to fail me and I wondered if I would even be discharged for inability to perform my duties. But the First Lord was on my case. I supposed by now that He must be a sort of Godfather or a relative of mine to take such an interest in my career. He promoted me once more - this time to "Seaman Third Class." As "Seaman Third Class" I began to understand that all the things I could do would only ever be "third rate" by Admiralty standards. I would, of course, do them to the best of my ability, but I had come to see that my own abilities were useless indeed for the task at hand. I was no longer responsible for the entire navy, or for the boat - not even for the other men on the boat. I was only responsible for doing my best with what was assigned to me. It was then that I finally met the First Sea Lord. I didn't recognize Him at first, because he was cleaning out the bilges in the bowels of the boat. When at last it dawned on me who he was I was stunned. He told me he had been managing my career every step of the way, ensuring that I would eventually be promoted to a level that was ideally suited to my abilities. He said he didn't need any help with the bilge or any other naval matters either, but he would welcome my working along with him just for the joy of the experience. And He promoted me on the spot to the pinnacle of my naval career. I became a "Cadet". This position was wonderful because it was to be permanent, even after the war was over. Somehow, the mere fact that I was at last where He wanted me to be, doing what He wanted me to do and doing it right alongside Him was liberating. I was free at last to leave the whole Navy in His hands, where it had actually been all along, and give Him all my attention and obedience, trusting Him for all the results.